Combined Pre-Medical Test (CPMT), Uttar Pradesh or simply UPCPMT is going to be conducted on 17 May 2016. 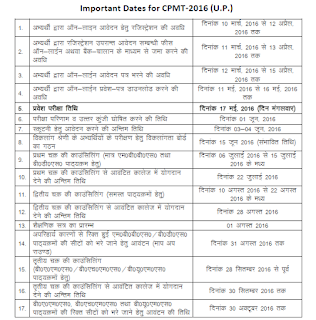 Earlier Dr. Ram Manohar Lohia Avadh University (RMLAU) had completed the process of getting applications for CPMT UP 2016. It is an entrance exam for admission to 1st Year of MBBS, BDS, BHMS, BAMS and BUMS courses in various Government and approved Medical/ Dental/ Homeopathic/ Ayurvedic/Unani Colleges of Uttar Pradesh. For appearing in this test, aspirants have to download the admit card as we are going to provide you a direct link through which the admit cards can easily be downloaded by entering details. Those candidates who had applied, can download UPCPMT Exam Admit card from the direct link given below. CPMT-2016 website is going to be available from 15th June to 14th July 2016. Candidates can fill up their bank account details to get fee refunded. UP Govt had decided not to held UPCPMT. All the seats of medical will be filled through NEET 2016. All the candidates of UP, can appear for NEET 2 to be held on 24 July 2016. The last decision of conducting either NEET or CPMT is to be decided by the CM of UP. In a recent meeting held on 25.05.2016, most of the reviews are on NEET. We will update you as soon as there is any more update. UPCPMT 2016 had been cancelled. Check Notice below. RMLAU conducts written exam in upcoming dates for CPMT exam. 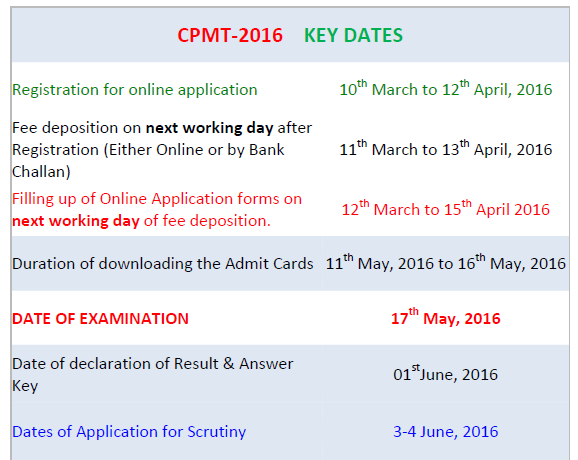 For that, the Admit card of UPCPMT will be released on 11 May 2016 and they will be available only till 16 May 2016. Candidates have to download CPMT UP admit card from the official website cpmtup2016.org via the direct link given below. The test will be held at various centers in Uttar Pradesh on 17th May 2016 (Tuesday). All the important details like exam venue, roll number, date and time etc. had been mentioned in the admit cards / hall ticket of CPMTUP 2016. Through this entrance test's merit and counselling, candidates can take admission in M.B.B.S., B.D.S., B.H.M.S., B.A.M.S., B.U.M.S. Courses of U.P. courses. 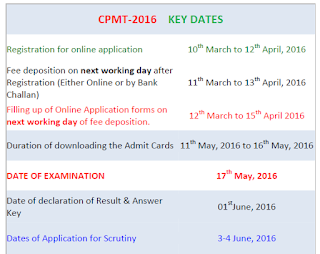 CPMT Admit Card can be downloaded using your valid Registration Number and Password during 11 to 16 May 2016. By Supreme court's orders in writ petitions 261 of 2016 and 292 of 2016, UP Government had cancelled UPCPMT 2016. The fee will be refunded and its mode will be notified soon. The written examination will be organized from 09:00 am to 12:00 pm. Questions will be asked from Zoology, Botany, Chemistry, Physics subjects. After the declaration of result on 1 June 2016, three counsellings will be held with first one starting from 06 July 2016. The candidates can download their admit card from CPMT website from here. It should be printed and brought at the venue to get a valid entry to the exam hall. No admit card will be sent by post. Admit Card shall be available for download on the assigned website for CPMT-2016, www.cpmtup2016.org. In order to download the admit card for UPCPMT exam, candidates need to visit the direct link provided here (after release). It will take you directly to download page. Then candidates need to enter their registration no. and password which you have got during registration. 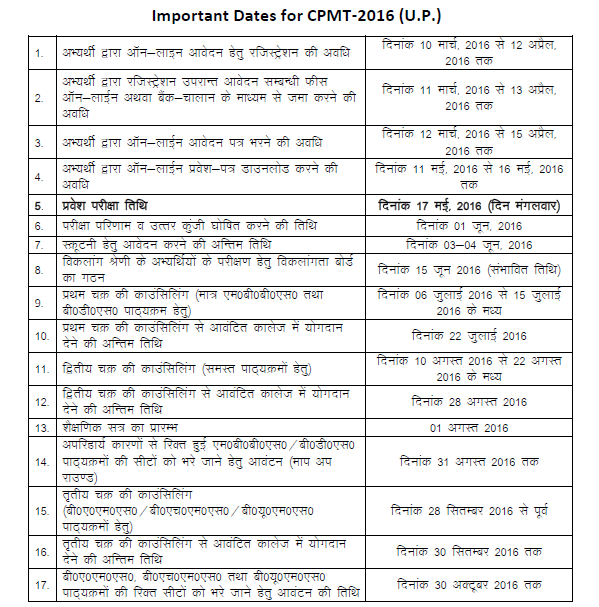 Their UPCPMT Admit card 2016 will be shown and you should note down the details.